It’s that time of year again. Baseball is in full stride and my team is doing well. The other day, though, they got beat pretty bad. If you looked at the seats in the last hour of the game, they were emptying out. The disciples had a more disappointing 9th inning, when Jesus went to His death via the crucifix. Perhaps they hoped for some last-minute reprieve from Pontius Pilate. Or, maybe they thought Jesus would put on His running shoes and take off for Egypt. Instead, time ran out, Jesus died, and the game was over. Funny thing about God, though. He loves hopeless, utterly hopeless situations. He wants to wait until hope is lost, faith is a mere cooling ember, and everyone has left the stadium. It’s actually the best time to go back and see what will happen. You see, while everyone was talking about “how good Jesus was” and how disappointed they felt, and they were beginning to mourn, God was resurrecting Jesus. The lights were out (in the tomb) the door (stone) was closed, and everyone was back home. But the light of the world was about to show them the Glory of God. He didn’t listen to the game being called at the end of the 9th. Instead, God made a tenth inning. An eternal tenth. A tenth inning in which He began the victory over not just the world, but the flesh and the Devil as well. 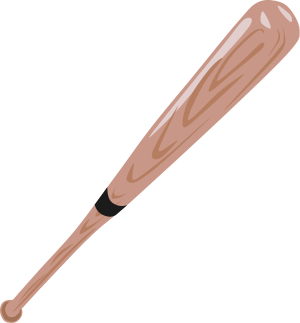 With just one small piece of wood, Jesus hit the home run of all home runs, bringing all the stranded base runners out of condemnation to the home plate of eternal grace and salvation. He crushed our enemies like a deep ball to left field. And people are still running home on that hit. May God give us the strength and courage to proclaim the greatest victory in the history of humanity to all people, Amen. Thanks for posting this on your blog, thoughfulbeliever!